I've had falafels a few times in restaurants, but only nibbled because I had no clue what was in them and wasn't sure if they passed the good-for-you test. 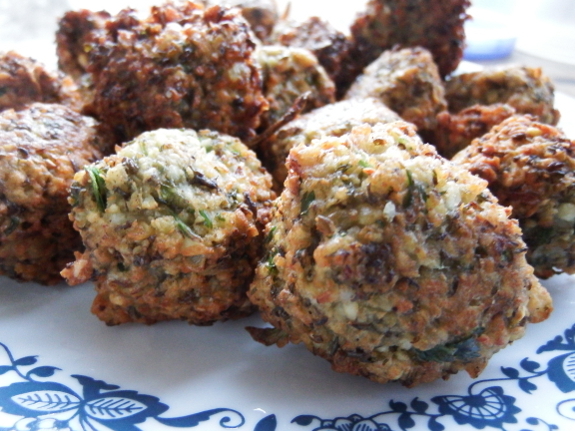 This week, I made my own for the first time and discovered that falafels are a unique combination of very high-quality ingredients...and deep frying. I used this recipe, slightly tweaked, and found the result very tasty, although perhaps a bit higher in onion than I'd like. For our next experiment, Mark suggested replacing half of the beans with canned salmon, then frying like cakes rather than deep-frying. Good thing we've got more mung beans to experiment with! That felafel sounds so good! I would love to try it with salmon in the mix. 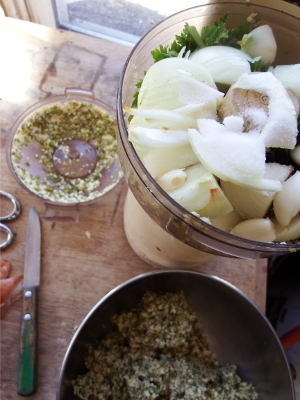 I did think that sure was a lot of onion in your food processor.